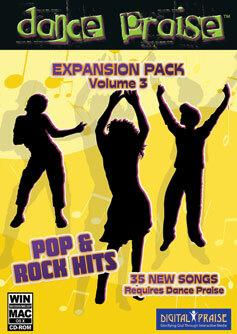 Pop and Rock Hits expansion pack adds 35 new pop and rock songs to Dance Praise and Dance Praise 2! 35 pop and rock hits from favorite Christian artists. With 3 sets of dance steps per song, that's over 100 new dances for hours of exercise and praise! Features music from hit recording stars, including Relient K, Bethany Dillon, Third Day, Kutless, Rebecca St. James, Nichole Nordeman, and other top artists. The 35 Pop & Rock songs are from 25 different artists, offering the most variety of any Expansion Pack in the series. From the silky sounds of Stacie Orrico to the pop-punk beat of Relient K to the inspirational lyrics of Jeremy Camp, this Expansion Pack includes something for everyone who appreciates the finest in contemporary Christian music.